How do I make models for MMD? 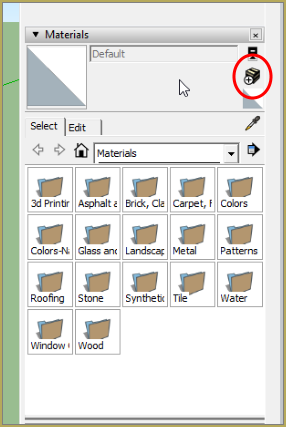 How do I save as an .X file in Sketchup? How do I make my own accessories/stages for MMD? How do I use the model I created in MikuMikuDance? 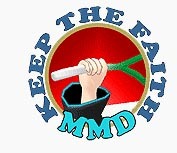 Goedendag lezers van LearnMMD. 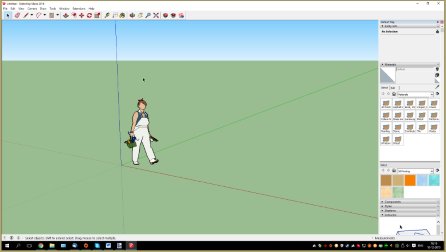 (Hello LearnMMD readers) In this article I will explain how to make your own models in Sketchup (formally Google Sketchup), and use them in MMD. We have some more articles about this, but those are outdated. 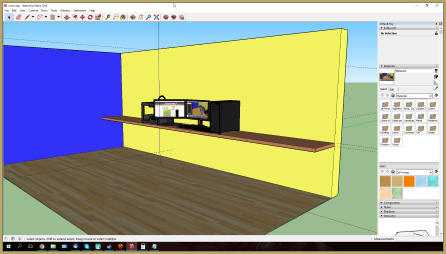 The new Sketchup versions handle curtain things differently. Making models can seem to be hard at first, but once you know the basics it’s pretty simple. 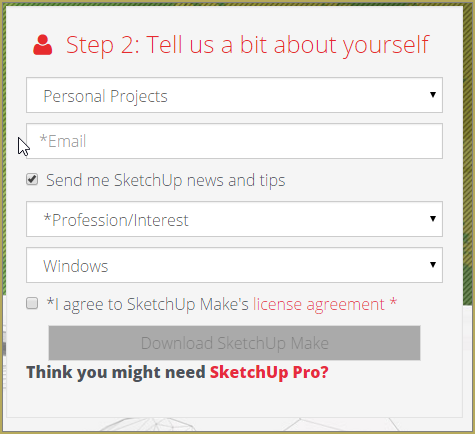 On our downloads page we have a link to the Sketchup website (at the bottom of the page), Download Sketchup Make. Tick the agree to license box and click download. 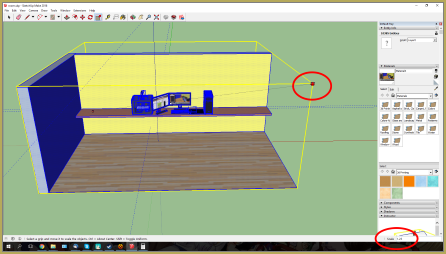 Make your model in Sketchup. It may look complicated at first, but trust me. IT ISN`T! I was able to use the basic features within a day, this program is easy to use, and there many tutorials online to help you. We even have a few here on LearnMMD.com like: The MikuBall tutorial and https://learnmmd.com/Sketchup_texture_directx_model/ But these are outdated. 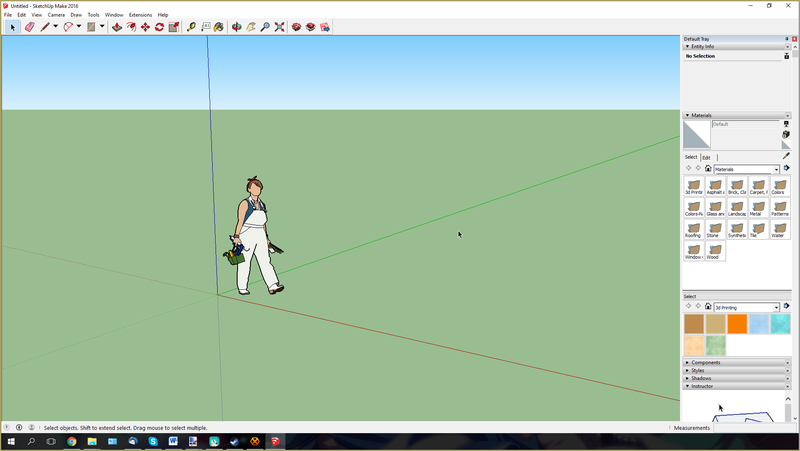 For MMDers the main thing that differs from the old Google Sketchup, (Sketchup isn`t owned by Google anymore.) is that it handles plugins a bit different, mostly it’s the same though. Ok, how do I make a model then? First thing I do is get rid of the person standing there, they will get mixed in your model if you don`t. Do this by selecting it and then press Delete. To create a simple room press the rectangle tool, in the dropdown you can select different shapes if you want to create different shape. You can use the push/pull tool to make it taller, but since this is the floor keep it as thin as possible. To create walls, simply use the pencil tool to draw lines. Use the push/pull tool to make the wall taller. Just tinker with the program, the basic tools speak for themselves. You can also go into the 3dwarehouse of Sketchup and find models others have made that you can implement into yours! Just download a model from there and open the SKP file. Just copy paste it into your model and use the move and rotate tool to position it. It may be a bit hard at first, but if you do as I described above it should be fine. You can use the paint bucket tool to add a texture to the model. This can be a solid color, but also a material or photo. You can use the stock textures provided by Sketchup, like I did for my floor. Ok, so how do I add my own textures? On the right of the screen you have a tray called materials, click on the + button. You can give your texture a name, but I just leave the normal name in. You can give it a solid color or an image, we are going to do this. Give it a size, this must be the same size as the surface you want to texture. You can use the measuring tape tool for this. When you enter your measurements click the chain, this will tell the program not to care about aspect ratios. This extension will help you to get rid of it. It does require a program to be installed, It is linked in the description of the extension. To load the extension go to Window, Preferences and then extensions. Click on install extension, open the file you downloaded. 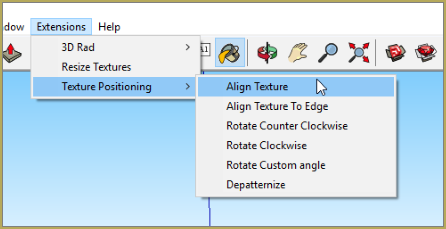 Click on align texture, it should fix the problem. It may still be off like I had with my monitors but it isn’t really visible unless you know it’s there. Scaling the model so it fits in MMD. MMD requires that the model is increased in size by 25%. To scale it you can use the scaling tool. Select the entire model and drag one of the upper corners, look in the bottom right corner of Sketchup. You will see your scale when you drag the corner, when the number says 1.25 release the corner. Now you should have your model scaled to the right size. MikuMikuDance can`t read SKP files. It does read .X files. We can export to this format by using an extension, but this extension is no longer available anywhere. Reggie was able to upload his copy of the extension to the LearnMMD website! You can download it from our downloads page, or use this direct link. Now click on Export as generic DirecX file (include backfaces), this will export it as an X file. This may take a while, even on my very fast system it does. If it looks like Sketchup doesn’t respond, just wait it out. When it prompts where you want to save the file you can select any folder, it doesn’t matter. There is a bug where it always saves to the documents folder no matter what you have selected. It will save under the correct filename so it is visible. It will also save the textures with it, these will be also be placed in the documents folder. 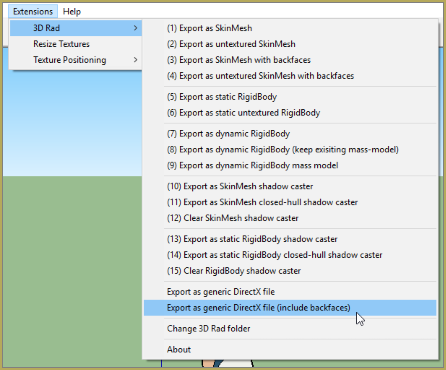 What you need to do is to move the .x file and all your texture files to a folder within the MMD UserFile folder. Loading your model is the same as loading any other accessory. Check the model and see if the entire model made it through the exporting part, and if your textures are there. Sometimes the 3DRad extension messes it up, in that case try to export it again. When you have a missing texture check your documents folder if you forgot to copy it over. Now you may need to do some fine tuning in MMD like changing its position if it is off center. Just edit the X Y and Z values in the AMP until it is in the right position. 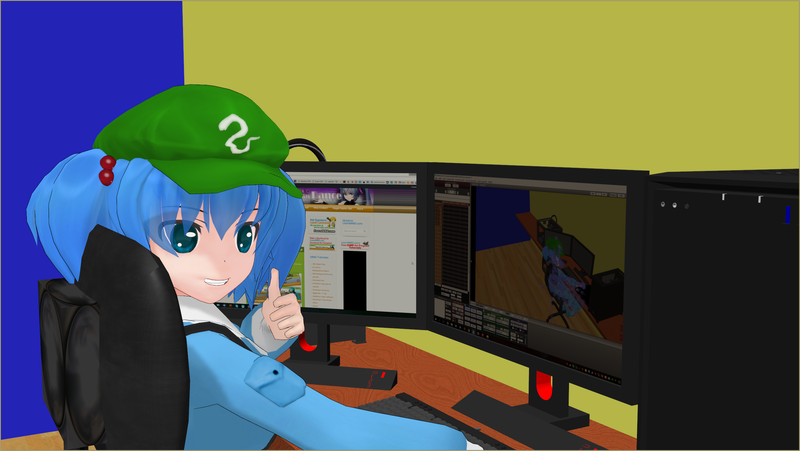 From here it`s just like any other MMD project. 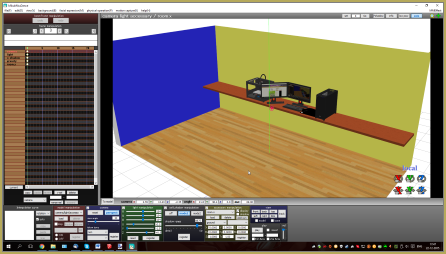 UPDATE 28-12-2015: Trackdancer has made an excellent article on Sketchup as well! Its a great way to take the information described here, and take it a step further! You can try to add a bone to it by ether using a dummy bone, or edit the model in PMDEdit. I didn’t include that because I don`t have much knowledge of PMDEdit. If you have any question or comments, please let me know in the comments. I will read them and try to help you as much as I can. how do you go to extensions in the 2014 version? Is it possible to import a stage from MMD to Sketchup? I did a GOOGLE search and found this $89 software: http://www.fluidinteractive.com/products/sketchup-extensions/fluidimporter/ They offer a free download for a 5-day free trial… maybe that will be long enough for your project… I know of no “free” way to do it. 1. Once you have reach this point “Go to the tools folder and drop the file you downloaded in there, your folder should look like this:” step (use ctrl+f). Proceed to step 2. 3. once it is a zip file, rename it and change the .zip into .rbz. If it says “if you change a file extension, it may become unstable” just click Yes. 4. 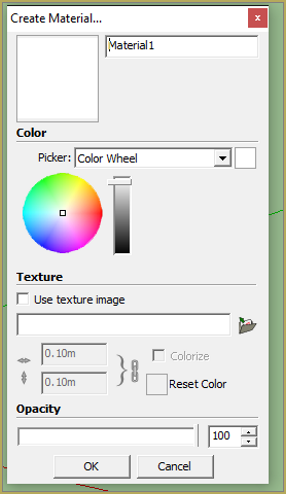 Load your .skp in sketchup and goto window then preferences then click extensions. 5. In the extensions system preferences, click “install extension” and open the .rbz file the you created at step 3. 6. You should see the extensions tab show up and proceed to the “Now click on Export as generic DirecX file (include backfaces), this will export it as an X file. ” part. This isn’t working in Sketchup 2017. I put the plugin into my Tools folder, and no Extensions tab showed up. The 3D-Rad plugin does not work for current versions of SketchUp. There are some DirectX export plugins in the SketchUp library but results can be mixed depending on the complexity of the model. Currently the best method to export a model for use in MMD from SketchUp is to export it as an OBJ file and load it into a 3D program like Blender and export from there. This is a roundabout solution, but I sometimes go this route anyway as there are somethings that are easier to do in Blender than SketchUp anyway. So, going this route, I do the initial build in SketchUp (faster), the interim build in Blender (notably texture mapping work) and the final reiteration (material specifications) in the PMD Editor. Currently, Blender still has the best Direct-X exporter for this format that I’ve seen. The 3D Rad exporter does a decent job but actually doesn’t create really efficient model data files and also it creates unwelded joints (you can tear some model apart easily using the PMD Editor). Amani… I am running Sketchup 2014 and the 3D-RAD plugin does work for that version. so I was like why not? Well, it’s because Sketchup 2017 only reads .rbz files, not .rbs files.